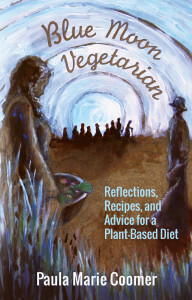 Some time back, early in the production of Blue Moon Vegetarian, I had queried New York Times best-selling author Caroline Leavitt about possibly writing a blurb for Blue Moon Vegetarian. I did this based on the fact that she had featured Valerie Miner, Standford University artist-in-residence who wrote a blurb for my collection of short stories, Summer of Government Cheese. I reasoned that if Caroline liked Valerie’s work enough to write about it, then she just might—by extension—like mine.